Yesterday was a fabulous day for a drive with not a cloud overhead. We headed to Waverley beach and enjoyed the wonderful sights on the way. 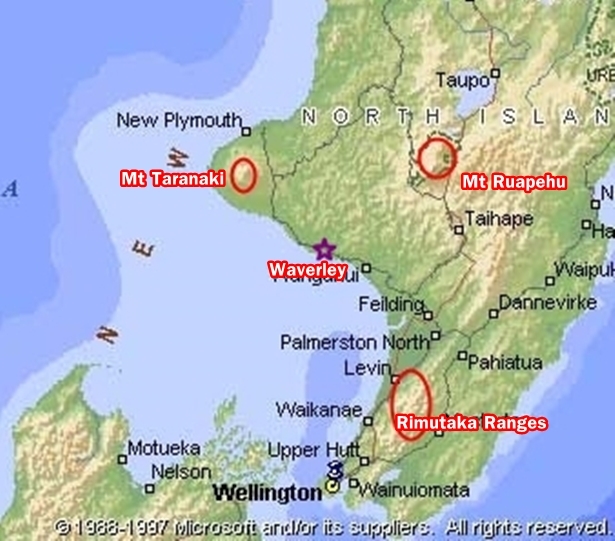 Of course, Mt Taranaki was ever present. We even saw the Rimutaka Ranges behind the cows! More Rimutakas in the distance with Kapiti Island (the dark island on the right of the ranges). Mr Ruapehu kept popping up in the distance. here's a map. We were about an hour from Mt Taranaki. 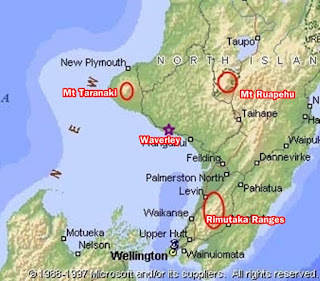 Both Ruapehu and Rimutaka would be about a 2-hour drive away. (Aotearoa, the land of the long white cloud) is correct. Lambie poohs! That is what we would call Blessings stuffed lamb animals. That shot of the cliffs is gorgeous too. these are lovely! have a beautiful day! What a fantastic day. I coastal photo just under the map is my favourite. Betty, you live in a beautiful land...thanks for sharing all of these gorgeous views. I love them all. I hope that you will visit again soon. The lambs are too cute, but stunning photos of such a beautiful country. What a blessing to live in such a beautiful place. Hello, what a beautiful place. I love the cute sheep! The countryside and the coastline are beautiful. Happy Monday, enjoy your new week ahead! I enjoyed seeing the barns, cows, and fences, but the beach scenes are my favorites! It seems comforting to always have familiar mountains around you. Love the Maori name. Beautiful surf. I believe the lamb in the first shot is smiling at you! Absolutely gorgeous photos of Aotearoa! So many wonderful photos. The little lambs were adorable. The mountains are stunning and I just love the shot with the long white cloud at the end. Wonderful place and excellent photography. I love that you have provided a map to show how far away all the features are. They certainly don't look that sort of distance at all. The last photograph is particularly apt. Beautiful photos Betty, such lovely scenery and pretty animals. The mountain shot is spectacular. Beautiful scenery and wonderful blue skies! Stunningly beautiful beach! But I enjoyed all the photos of a land I've never seen! Beautiful landscape and charming lamb! I love knowing the Maori name for your beautiful country. Based on that picture, it is certainly accurate. The quiet beach is absolutely lovely as is your wonderful Mountain! Beautiful drive.